Past US presidents have puled the Axis of Evil label out to tag various disparate countries that are not favored by the US government . The links have been dubious. But there really is an Axis of Evil now emerging. Events developing in recent days suggest that the Axis is gaining in cohesion. This suggests trouble for the immediate focus of their attention, Iran. the governments of Saudi Arabia, Israel and the United States. Iran is a regional rival of Saudi Arabia and Israel. At the same time, Iran is no threat to the United States. 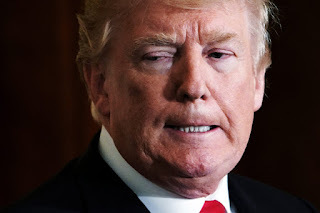 But the US government under the leadership of President Donald Trump considers Iran a problem. 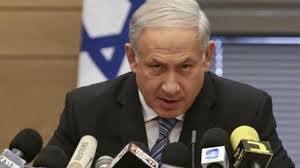 He is expected to soon tear up the nuclear agreement made with Iran that President Barack Obama signed. From the start, Trump filled key administration positions with Iran-haters, including Michael Flynn, Nikki Haley and General John Mattis. Although Flynn is gone, the situation got worse this past week when Trump announced that he has chosen the bloodthirsty war hawk John Bolton as his national security adviser. Thus, assuming the confirmation of Michael Pompeo as Secretary of State, Trump will have three Iran-haters as his top foreign policy advisers in Pompeo, Bolton and Haley. This is a war team. It should be noted that just prior to the announcement of Bolton to be Trump's top national security adviser, Trump met with Israeli Prime Minister Benjamin Netanyahu at the start of the month. 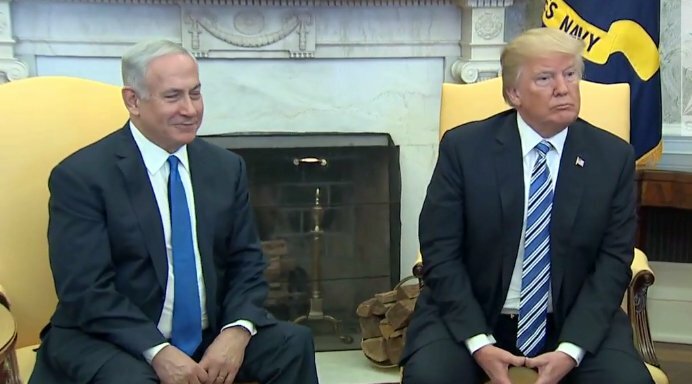 Netanyahu asserted in the Oval Office the day of the meeting that the nuclear agreement with Iran had “emboldened” and “enriched” Tehran. "If I had to say what is our greatest challenge in the Middle East to both our countries, to our Arab neighbors, it’s encapsulated in one word: Iran,” he said. Just a couple of weeks after the meeting with Netanyahu, Trump met in the White House with Saudi Crown Prince Mohammed bin Salman. Trump crowed, with MbS next to him, of the arm sales Trump had negotiated with Saudi Arabia. Beyond doubt, MBS and most Saudis like Trump's anti-Iranian rhetoric. For them, he is an American President who is much more in tune with their interests than President Obama was. Both leaders read Iran's actions in Iraq, Syria, Lebanon, Yemen and beyond as a threat to regional stability. Both have talked openly about curbing Iran's growing military clout. 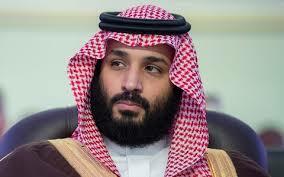 MBS and his brother may be getting closer to what they want on Iran. This week Trump fired his Secretary of State, who had become a brake on the President's impulse to exit the Iran deal. Trump's son-in-law, Jared Kushner, who is also close to Netanyahu, has made a number of originally undisclosed trips to Saudi Arabia to meet privately with MbS. Reportedly, they talked and plotted well into the night. And so after meetings with Netnayahu and MbS, Trump is rid of the moderate Tillerson at State and he has replaced him with the war hawk Pompeo and the war hawk on steroids John Bolton has been named national security adviser. But here is the real tell as to the coalescing of the anti-Iran Axis. Saudi Arabia has opened its airspace for the first time to commercial flights to Israel. Saudi Arabia – birthplace of Islam and home to its holiest shrines – does not recognize Israel. [The first flight] Flight 139 landed at Tel Aviv’s Ben Gurion Airport after a seven-and-a-half hour journey [from India], marking a diplomatic shift for Riyadh that Israel says was fuelled by shared concern over Iranian influence in the region. The bloodthirsty Axis is coalescing. Can war be far away? It can’t be truthfully be said by those who supported Trump for President, that he misled them about his views of Iran and the Iran nuclear deal. He always strongly opposed the Iran nuclear deal and Hillary supported it. While Trump has no identifiable principles, or at least none that are consistent with liberty, it's clear that the problem with the US is not the man in the White House, but the existence of the federal government itself, with its members' insatiable appetite for power and unending ability to finance their evil through monetary inflation. Different men and women come and go in different administrations, but the US just becomes a bigger and bigger problem on the world stage. Obama (with Team Diversity, namely, Clinton, Power and Rice) doubled down on and didn't pull out of Iraq or Afghanistan, supported the incursion into Libya, stuck his nose into Syria and ramped up drone aggression. W did Iraq and Afghanistan. Clinton did Serbia. Bush Snr. did Iraq. Etc. Either it's the case that being part of a machine like the federal government does something awful to a person or, more likely, as Hayek once noted, the worst people are attracted to this beast. My point is that while it's tempting, and easy, to focus on the lunacy of the moment, it's important not to forget the bigger battle for liberty and peace. Getting into arguments over who would have been better as president or comparing actual presidents is pointless: we should be focused on undermining support for the presidency and federal government as institutions, regardless of who is temporarily in charge. 100% correct. Parasites (those who live by means of the extortion racket called taxation and the counterfeiting racket called monetary policy) are always and everywhere seeking control of those upon whom they feed. Floating together on their bubble of free money, they spend their days competing with one another over who will have the top title and who has the best plan to grow the rackets. It is a mistake for us to care. We should be focused on wrecking the rackets by informing the victims that they are comparing racketeers, not leaders, not heros. Authority = parasites. Always. Everywhere. You got this correct Robert. This is axis is centered around Zionism. You have Jewish Zionists, Christian Zionists, and Wahhabis are Muslim Zionists. Back in 2016 there was a conference of top Sunni scholars in Grozny that removed Wahhabis from Sunni Islam [1, 2]. The truth is that Wahhabis spend all their time excommunicating both Sunni and Shia Muslims in order to justify killing them all over the Muslim world. These are the same people and ideology that have never attacked Israel or Zionists in their history, even while regularly attacking Christians, Hindus, and others. The Wahhabis have around 6 million adherents. Sunni Muslims number over 1.7 billion people. The Wahhabis are not leaders, or even representatives, of Sunni Muslims: NO ONE who is a Sunni Muslim is going to join Bin Salman's army to attack Iran (or anyone else). They can pay mercenaries to fight and die for them, but that will not be an ideological fighting force. Even with ISIS, the Zionist axis had to buy an army and they could only get what, 30,000 people to sign up? Out of over 1.7 billion Muslims, that is pathetic.